Tony Swan, looking like he enjoyed the high-tech tools of being an auto journalist, was spotted in the San Antonio airport in April of 2017. Weakened to a point of unwilling fragility after trying every potential method of fighting the insidious disease, Tony spent most of his final week in a gentle hospice facility near his home in Ypsilanti, Michigan. After final farewells to his devoted wife and partner, Mary, and insisting his gathered kids from an earlier marriage talk about seeing each other soon, rather than saying goodbye, Tony allowed himself to relax and slip away overnight. For most of four decades, Tony Swan and I were the only two automotive writers from Minnesota. Times have changed, with a new generation of social-media types have blogged their way into the business, not always with proper responsibility in our estimation. We always discussed such matters because even though we had taken widely divergent paths to whatever status we attained, we remained close friends for something like 55 years, ever since we attended the University of Minnesota journalism school together back in the 1960s. Those divergent paths were because Tony and I shared a love of cars, which led him on an upward spiral from AutoWeek to Popular Mechanics, Motor Trend and Car and Driver. My journalistic drive, so to peak, was split between hockey and sports writing on one hand and auto writing and motorsports on the other, a form of writing ambidexterity that made me determine to stay in Minnesota. In an odd way, we always had each other’s back, regardless of how scarce out time together was during my 30 years at the Minneapolis Tribune and later return home to Duluth for a couple of opportunities and more recent freelancing. Tony lived his life by his own rules, and that carried over to friendships and arguments. Our mutual passion for motorsports led us both to pass road-racing schools at Sports Car Club of America venues when Showroom Stock Sedan racing started in the early 1970s. I did it for a year or two, and to this day employ some of the smart-driving techniques we learned there, while Tony continued racing a little, most recently in the low-budget “24 Hours of Lemons” series for cars with a $500 maximum value. Tony mostly enjoyed keeping things simple behind the wheel. He was an excellent driver, and except for a few speeding tickets now and then, he didn’t overdo it on the streets. His personal car of choice? A Volkswagen GTI, the no-compromise performance model of the Golf. Inexpensive, comparatively speaking, and with a six-speed stick shift because it was most fun that way and, as a simple pleasure, it gave him total control. Tony and Mary lived in Ypsilanti, Michigan, close enough to Detroit, the nation’s automotive nerve-center. At age 78, Tony had eased back from his writing at Car and Driver magazine; I was never sure it was his own call, because a new generation was taking over, and he kept free-lancing wherever he could. Writers rarely talk or write about other writers, but I will. Anyone who read about cars for the last few decades has read something by Tony, in one of those “buff” magazines. Others will write about what a great guy he was, a warm human behind that curmudgeon-like demeanor. I will simply say that he was that, but he also was the most skillful writer for every publication he worked for. Tony grew up in the western suburbs of Minneapolis, near Lake Minnetonka. He was a couple years older than I, and we hit it off because we both had cynical senses of humor, and we could crack each other up anytime we got together. I left for a two-year experience writing at the Duluth News Tribune, then accepted an offer from the prestigious sports department of the Minneapolis Tribune about the time Tony got a job writing sports at the St. Paul Pioneer Press. The papers were bitter rivals, but Tony and I stay friends while competing in print, both covering hockey all winter and motorsports all summer. We never told our papers, but when we were sent off to cover Glen Sonmor’s University of Minnesota hockey team for a heated series with Badger Bob Johnson’s Wisconsin outfit, Tony and I would share a drive from Minneapolis to Madison. We kept each other awake, and in stitches, when we drove home through the night after the Saturday game. We’d make a stop for soup, a sandwich, or a piece of pie at Grandma Smrekar’s all-night cafe at Millston, Wis., and invariably we’d end up laughing like fools over something that a normal human might find inconsequential. Tony left the Pioneer Press to join an attempt by a suburban paper into a special-edition sports scheme. It didn’t work and was disbanded, leaving Tony out of writing while I was on an upward trajectory writing sports and an automotive column for the Tribune. I was flattered that management, advertising, and, most importantly, readers enjoyed my take on both subjects.. So I turned them down, but I suggested that I knew an exceptional writer who might be perfect for their job, and how to reach Tony Swan. He jumped at it, and stayed with it, moving to the West Coast as it morphed into a travel feature, the perfect launching pad to join AutoWeek, then Cycle World, then Motor Trend and Popular Mechanics, before relocating back in the Midwest in Detroit to write for Car and Driver. We stayed connected at auto shows and other places. Covering a race at Donnybrooke Speedway stands out, because Tony was doing a lengthy report on a Peugeot diesel, which he drove from Detroit, timing his trip so he could visit his family on Lake Minnetonka and cover the road race. Those of us who regularly made that trek from the Twin Cities to what became BIR took the smaller but faster and less-congested Hwy. 25 north off Interstate 94 and straight into Brainerd. The Peugeot Diesel was a great long-running car but not fast, being before turbocharging came into fashion. So when Tony stepped on the gas, there was no evidence the pedal had any connection to the engine for a mile. The only car on the road with him was just ahead, some guy who didn’t want his big American car to be passed by that foreign thing. Whenever Tony pulled out to pass him, the other car would accelerate just enough to stay ahead, then slow down until Tony would try again. It was maddening to Tony, so he plotted ahead, where he knew of one particular 4-way stop in an otherwise deserted rural area. Approaching that intersection, you could see for a mile ahead and both ways on the crossroad. So Tony backed off a bit, and when the other driver started to slowed down for the stop, Tony had stayed hard on the gas and pulled out, flying through the four-way stop and passing him at 75 just as his tormentor came to a complete stop, settling that issue. Swan was one of the founders of the North American Car of the Year award, given out every year since 1993 by a panel of selected journalists. In its second year, Tony called me and invited me to join the jury. It wasn’t out of friendship, but because he respected all I had done as the only person writing about cars in Minnesota. I enjoyed my 13 years on that jury, contributing several suggestions that I thought helped streamline the selection process and gaining publicity for the award. Years later, a fellow decided to cut me from the group, for his own reasons, and Tony fought the move and led a group that argued in my favor. I’m forever indebted to him for his attempts to aid my cause in what had become a hotly political group. 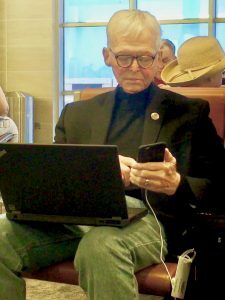 I was flown to San Antonio for a new vehicle introduction in April of 2017, and as I left my plane and entered the gate area, I spotted Tony sitting in a chair, writing something on his computer while he operated his cell phone, which was plugged in recharging at the same time. I couldn’t resist shooting a photo of it, because Tony didn’t see me, and while he looked like Mr. High Tech at the time, I knew he hated all these new-fangled devices. By then, Tony had been diagnosed with cancer, and had explained it to me in considerable detail. He was optimistic about beating it, and continued testing cars, writing about them, and racing in his vintage class as he tried some new procedure. He fought it, and won a few rounds, but it was sinister and kept coming back or worsening. He’d pursue the every suggested treatment, but the dreaded disease would circle back and strike somewhere else. All the while, his weight, and his strength, were being diminished, but not his spirit. I tried to cheer him up to keep fighting, knowing well that he would, by phone calls, e-mails, or phone voice-messages. Later, I attended another introduction where he had canceled. So I explained some neat technical features on the new vehicle to keep him updated, and I used text messaging again — the rest of my family’s favorite method of communication. Tony responded and talked about other models that had been engineered impressively. Then I realized, here was this master auto reviewer who can understand the finer engineering points of a new car, and he still didn’t like things that were fancier than need be, and he had never heard of text messaging, or willingly engaged in it. Numbered e-mail? I loved it. Tony and Mary drove to the Twin Cities to see family member again in late September, and Mary helped him attend a Gopher football game by wheelchair. It was perhaps too much for him. On their drive home, they decided to drive south, which was fortunate, because Tony had some serious issues that caused them to make a side-trip to the Mayo Clinic in Rochester. They get him patched together for the rest of the long drive, and Mary noted on his Caring Bridge page that he finally agreed to go right into hospice care upon their return. I went to bed and slept hard, but I woke up four or five times, and each time I was surprised that my thoughts were focused on Tony Swan. When it was time to get up, as the first sunlight ventured across Lake Superior, I noted the trees in our yard blowing back and forth with great force from the persistent wind gusts. Then I spotted the Caring Bridge notification from Mary that said Tony had peacefully ended his battle overnight. It called for one final message to Mary, where I offered our sincere condolences, and described the oddity of waking up repeatedly through the night, focused on Tony each time, and then spotting the trees being blown back and forth. I submitted to her that Tony will always be with us, and maybe the wind-blown trees meant it was Tony’s spirit, making one more lap around his beloved Minnesota.